Asgard Electric Department - "Hot Sparks!" 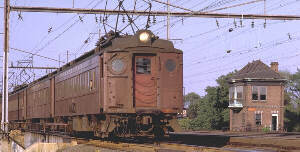 The great electrified lines of the Lackawanna and Pennsylvania are still a fixture in these parts. Come see what al lthe fuss is about! In the early 1900s, cities were worried about air polution. Steam locomotives added plenty of smoke to city air. Fortunately, some railroads were experimenting with electrically-powered trains. These trains made no smoke at all! 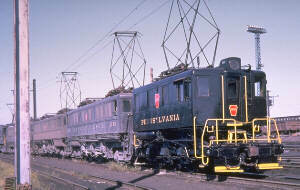 The Lackawanna, the New Haven, the New York Central and the Pennsylvania Railroads had several of their routes electrified. These routes are still heavily-travelled! To supply electricity, the railroads erected overhead wires. The overhead is called a "catenary." Bare wires carry elecricity. 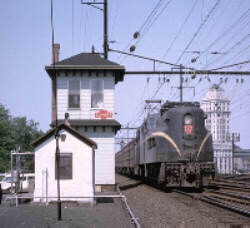 Locomotives have a special, cage-like contact on the roof that touched the catenary. Electricty flows through the contact to a large electric motor. Most electric trains do not need a lot of power because the carry passengers, so they do not have a large engine. They do not even look like locomotives! 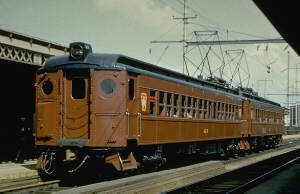 They are passenger cars with an engineer's compartment in front. These are commuter trains - short trains travelling a small distance. 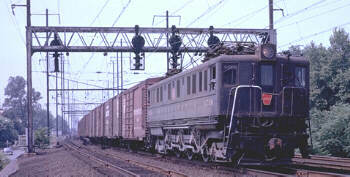 Other trains need more power, and they are pulled by huge electric locomotives. 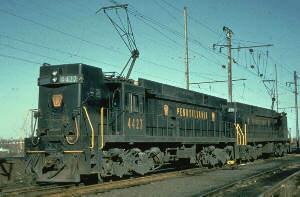 The most famous electric locomotive was the GG1. It had more power and it was reliable and fast. Some electric trains do not use catenaries. They use a "third rail" which is to the side of the tracks and slightly raised. 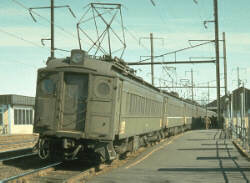 A special flat plate called a "shoe" on the side of the car contacts the third rail, pulling in electricity for its motors. Third rail systems are mainly used by subways and city commuter lines. If you see a third rail, never touch it The electricity is anywhere from 20 to 60 times more powerful than the current in your house! It can hurt you badly, burn you, or worse! Be safe - stay away from electrified roadways!